Another fight filled with tragedy. And not just because Striker never got any beads for this. 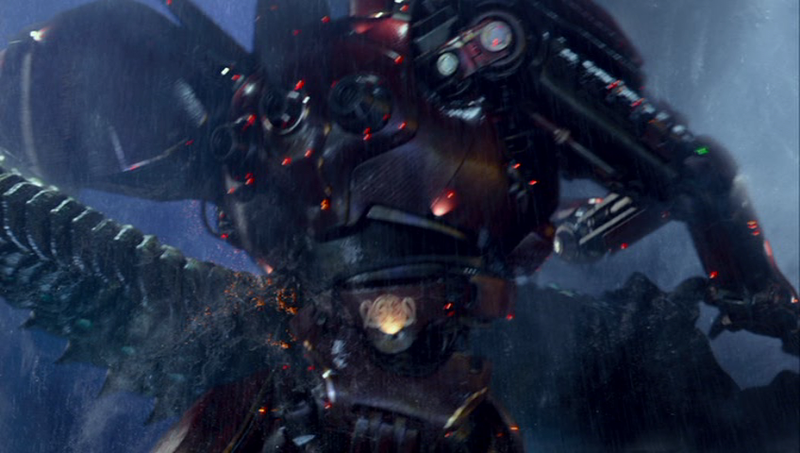 If Pacific Rim has any major weakness it’s that it sags in the middle. Not terminally– what does transpire is watchable enough if a bit cliche-ridden and predictable, plus there are a couple of human physical sequences we’ll get to later– but if you came for giant robots fighting giant monsters (and of course you did), there’s a huge stretch of time where that is inexplicably not happening. Fortunately the movie makes up for it when the action finally does rev back up, giving the audience three big fight sequences that are practically back-to-back-to-back, and a climax not too long after. This is where the movie starts to make its money. Crimson Typhoon, a robot made and by piloted by the Chinese (the jaeger program is an international effort). Unlike the other machines it has a third arm, made possible by its number of pilots. Rather than hands, each arm has a large spinning blade attached to the end of it, making this the jaeger’s primary offensive attack. Typhoon uses the blades in a technique called the “Thundercloud Formation,” the specifics of which are vague but is apparently designed to allow a continuous and seemingly unblockable offense. The robot’s head is also smaller than other models’ but more easily moved, increasing the pilots’ ability to see at the expense of heightened vulnerability, since the head is where the pilots are located. This will turn out to be a bad trade-off. Piloted by: Cheung Wei Tang, Hu Wei Tang, and Jin Wei Tang, Chinese triplets and martial artists. Played by Charles Luu, Lance Luu, and Mark Luu, who are, you guessed it, real-life identical triplets. Good thing for them they’re Chinese and not North Korean. Supposedly Guillermo del Toro wanted quadruplets for the role but couldn’t find any so he had to settle for triplets… which is mystifying because the Wei Tangs are on-screen for so little time a fourth could have easily been simulated using movie tricks that have been around since at least The Parent Trap. Heck, they could have done it all with just one guy. Cherno Alpha, the Russian jaeger and one of the oldest around. Big and simple in a very stereotypically Russian way: ugly, but it gets the job done. Unlike the other jaegers (especially Typhoon), its head is a thick, heavily protected tin can connected directly to the torso, with no “neck” or other vulnerable spots– you know, like the guy who used to beat you up in high school. Doesn’t seem to have any offensive powers besides its extra-large fists. Piloted by: Aleksis and Sasha Kaidonovsky, a Russian husband & wife team. Like the Wei Tangs, they’re not much of a presence in the movie, but they still make a strong impression with their imposing size, stoic attitudes and outrageous bleach blonde hair. Played by Robert Maillet and Heather Doerksen, the latter of whom probably had to endure a lot of taunting in primary school. Striker Eureka, an Australian jaeger with the highest kill count on record. A newer, sleek and speedy model. Like Gipsy, Striker largely gets things done physically (aided by some sharp-looking prongs at the top of its wrists), but it also houses six short-range missile launchers behind a retractable chest cavity. It’s unknown just how powerful the missiles are, but one barrage was enough to finish off a tough-looking kaiju earlier in the movie (in a battle so fleetingly glimpsed via news report earlier in the movie it’s not worth writing up), which makes you wonder why cities don’t just set up similar missile batteries near their coastlines. Otachi, a more lizard-like kaiju who prefers to crawl about on all fours. 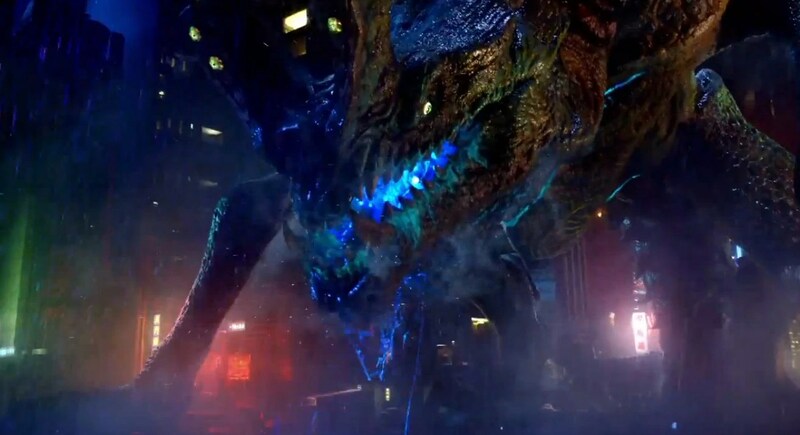 In addition to the deadly claws & jaws that all these beasties seem to come equipped with, Otachi (Japanese for “big sword,” apparently) also has an extra-long & thick prehensile tail, with another large gripper claw on the end of it. It can also spit large amounts of corrosive blue acid which it stores in a sac underneath the chin. And this won’t come into play until later, but Otachi also has a set of strong wings hidden in its forearms. Leatherback, a fat kaiju with a gorilla-like body who walks dragging the knuckles attached to his enormous forearms. Big & strong, of course, and he has some sort of alien device on his back that can release an electromagnetic pulse (EMP). Whew, that was a long one. So Striker hugs the coast while the two other active jaegers venture out to find the approaching kaiju. It doesn’t take them long. 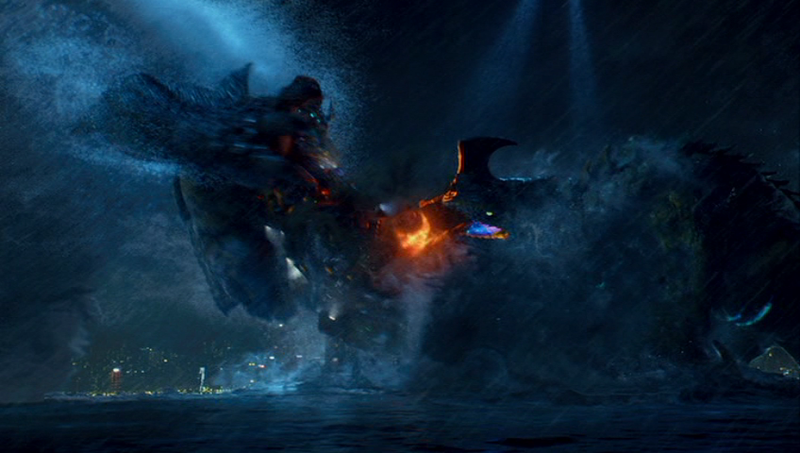 The Fight: Otachi, not one to beat around the bush, pops out of the water directly in front of Crimson Typhoon. After a brief holler, it spins around and floors the jaeger with its massive tail. Sweep the leg! Typhoon pauses and actually shakes its head a little bit before getting up, the way a human would after taking a hard knock. Presumably this is because the pilots are a bit dazed from the fall and the jaeger is only following their movements, but it’s still a funny touch because it looks like the robot is dizzy, which is hilarious. Typhoon arises and attacks Otachi using Thundercloud, all three blades spinning madly. The brothers get in a good five or six swipes, ripping several tears across the kaiju’s ugly gut, before Otachi seizes two of the jaeger’s hands in its own claws, crunching the blades good. Rather than just going to town with the remaining third limb (this would kind of seem to be what it’s there for, no? ), Typhoon responds by using the jets on its back to leap into the air above Otachi’s head, but remains vertical and still with its hands caught in the monster’s claws. It looks like the world’s biggest, slowest suplex, except it’s self-inflicted. While Typhoon is briefly suspended above Otachi’s head, the pilots swivel the entire lower half of its body (that’s nifty) so that it lands with increased leverage, which it then uses to fling Otachi several hundred feet through the air. 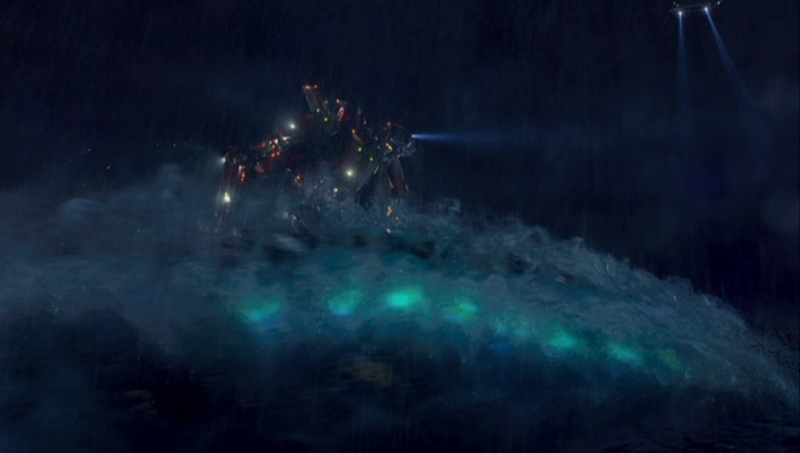 The kaiju stumbles in the shallow water, where it finds Cherno Alpha ready for business. The beefy jaeger wastes no time charging in and delivering an elbow drop (more rasslin’ moves!) to Otachi’s long neck. Cherno segues right into a headlock and follows up with a few blows to the monster’s face. It can’t finish the job, though, because the creature’s tail swipes in to knock it down. The Hansens see this and want to help, but are told to stand down by command. Meanwhile, Typhoon closes back in on Otachi, so the beast is surrounded and seemingly in trouble. But that damn tail is still too unpredictable for the pilots: it whips in and smacks Typhoon, and the claw at the end of it grabs onto Typhoon’s head/cockpit. This spurs the Hansens to finally disobey orders and start rushing over to help, but it’s too late to save Typhoon’s noggin: after a little bit of wrenching, the entire thing gets yanked clean off, and flung carelessly into the sea. Just like with Yancy we don’t see what happens to the triplets inside after that, but they almost certainly didn’t survive. As for Crimson Typhoon, well, now he’ll never be the head of a major corporation. Really, as I said earlier, that was a serious design flaw. Surely they could have found a way to increase the jaeger’s visibility (cameras embedded in the sides, or something) without leaving its pilots so exposed. 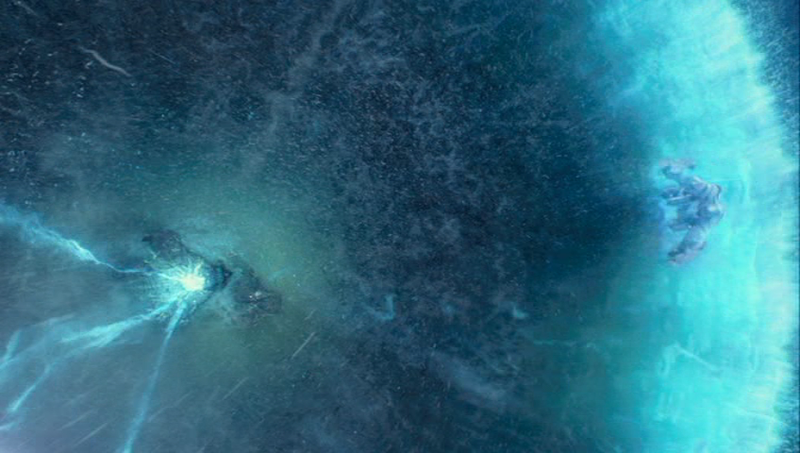 This is twice now in the movie a jaeger has been quickly compromised by a direct attack on its cockpit. That’s not the way to get ahead in life. Anyway, Cherno Alpha’s pilots see this and are pissed. 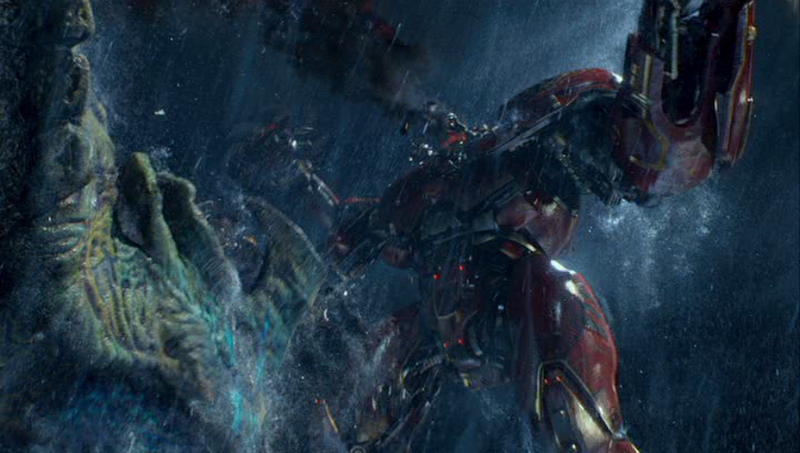 The jaeger clangs its fists together in anticipation, and rushes at Otachi. Unfortunately, Otachi does its Linda Blair impression and hits Cherno square in the face with deadly acid. The jaeger is damaged but not down, even though the acid quickly leaves the pilots directly exposed. Otachi bites into Cherno’s arm and the jaeger starts to fight back, but his fate is sealed when Leatherback decides to make his entrance. 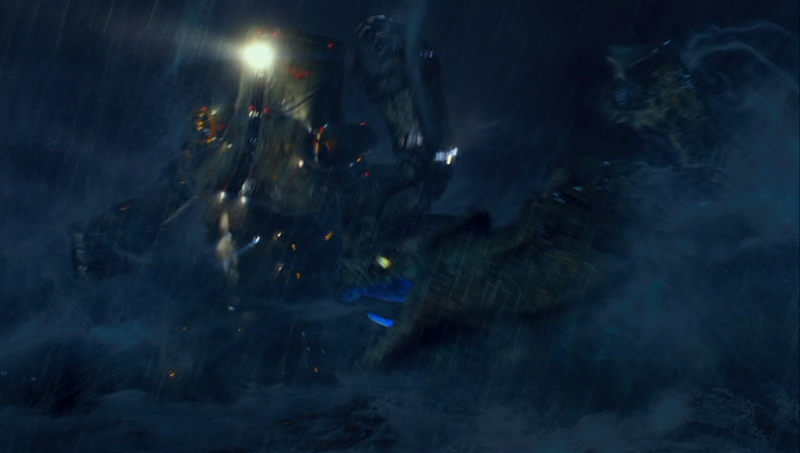 Leatherback clings onto Cherno’s back and starts tearing it up from behind, even as Otachi keeps at it from the front. Soon enough the latter decides that Leatherback can finish things off on its own, and goes off to engage Striker Eureka. Indeed, Leatherback does make short work of things, seizing Cherno and shoving it into the ocean. There’s a strangely personal & chilling malice in the way the monster simply holds the robot down, waiting for the inevitable to happen. Water floods not just the pilots but also the reactor, shortly triggering a muted explosion that saves the pilots the indignity of a slow drowning death. Meanwhile, an enraged Striker has been ruthlessly pounding on Otachi. 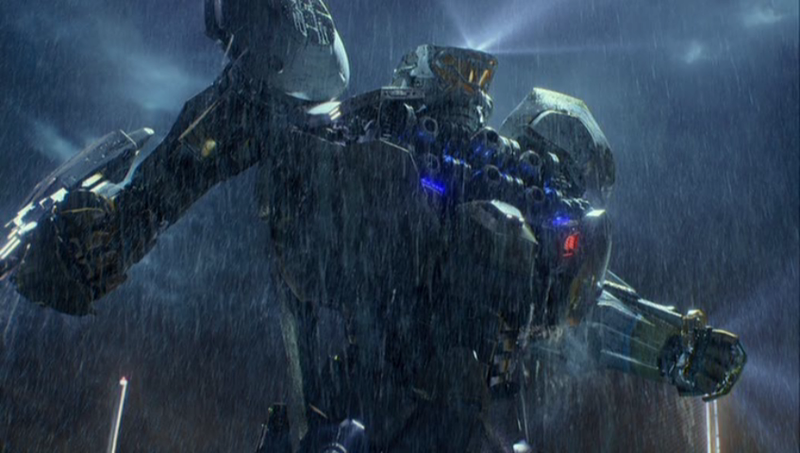 The jaeger finishes up by hefting the kaiju above its head and giving it a mighty toss– maybe not the smartest move on the pilots’ part, since the landing in deep water doesn’t really hurt it, and Striker would have been better off pressing the advantage. Maybe they only did that so they’d have a safe distance from which to fire Striker’s missiles… but that doesn’t work either, because a freshly-unoccupied Leatherback sees the danger and activates its EMP. To slightly paraphrase War Machine: Why didn’t they lead with that? Really, it could saved the kaiju a lot of hassle. Getting all their targets in range couldn’t have been an issue, because the pulse extends at least all the way to the shore. As Striker stands inert, the two monsters have a brief exchange. 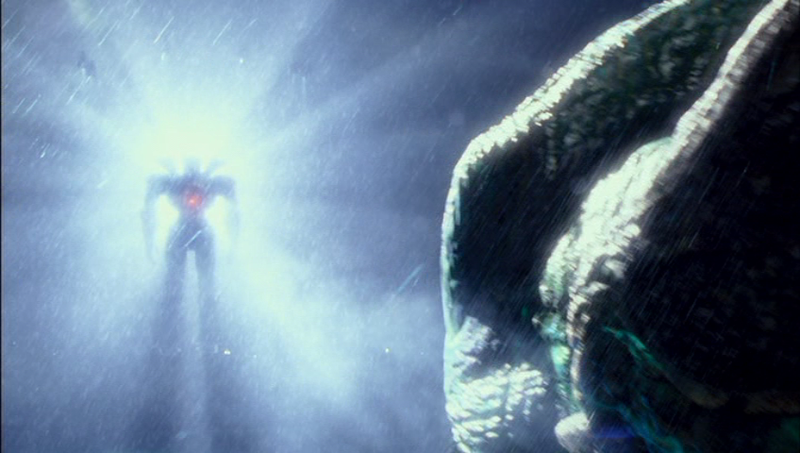 Otachi charges off to find Dr. Geiszler while Leatherback stays behind to menace its motionless enemy. There are a couple cuts away to headquarters and the doctor’s misadventures in the city, but soon enough we come back to the two pilots in their useless robot. They leave their harness just as Leatherback gives Striker’s head a playful smack, which leads to Herc falling and hurting his arm. There’s some macho arguing, but ultimately the two decide to “do something really stupid”: rather than sit there and wait for the inevitable doom, the Hansens climb outside to almost literally spit in Death’s eye. Armed with flare guns, they wait for a curious Leatherback to examine them up close, and fire a couple shots right at some of his six eyeballs. The monster is none too happy and raises his fists to take them out, when suddenly a spotlight hits him from behind…. Well. All kidding aside, this is some pretty harsh stuff to watch. Probably not as much as it would be if we’d actually gotten to know some of these now-dead characters (and their awesome jaegers) on anything but the most surface of levels. To be sure, some of the mystique surrounding the Russian & Chinese pilots is owed to them being more on the periphery, but it’s possible to flesh out a supporting character while still maintaining his or her mystique. As it is, these folks are barely cameos before this. The way the fight unfolds also underscores the problem of the movie’s necessarily rushed storytelling. This is the first really extended monster combat we’ve seen so far, yet it’s filled with at least three “this has never happened before!” moments: two kaiju attacking simultaneously, a kaiju using projectile spit, and a kaiju with a sophisticated technological attack. We have minimal grounding here, jumping into this war just as it’s starting to get truly interesting and desperate. All that being said, the fight is astounding. With five combatants constantly shifting back & forth and some unexpected attacks (not just the obvious ones like the EMP and acid spit either; Otachi’s crazy tail is another game-changer) this is a WAY more dynamic fight than the opening number. 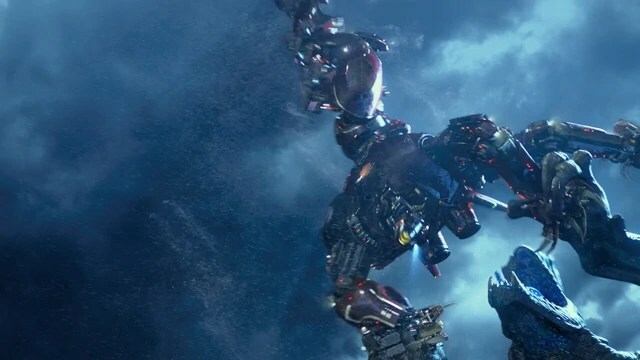 We get to see a few more tricks from the jaegers as well, and of course there’s that crazy sense of scale that Pacific Rim’s fights operate on. This battle puts a very effective cap on the tail end of the second-act doldrums, and excellently sets things up for the big turnaround. Coming Attractions: Looks like Team Elbow Rocket’s blasting off again…. This entry was posted in Pacific Rim and tagged melee, Pacific Rim, science fiction.